With the onset of energy-conscious consumerism, there has in turn been the creation of energy-oriented marketing campaigns. One of the most prominent campaigns has been those of window manufacturers and installers, with most of these campaigns focusing on window replacements. There have been varied opinions on whether the replacement of windows is warranted. Ultimately, the numbers prove that unless your windows are extremely leaky or in disrepair the replacement of windows has an extremely long payback. This extended payback makes window replacement one of the last items on a proper energy conservation list of improvements. However, window installation in new homes takes on a different perspective. Due to windows playing a large part in the energy consumption in a home, they are one of the most important factors to consider when building a home. This may seem counter to the above perspective, but one must consider that when building a new home, one must install windows. The additional cost for improved and more energy-efficient windows are minimal compared to the amount of savings they will produce. In new energy-efficient construction, window selection should be considered just as important as selecting your HVAC system or site layout. 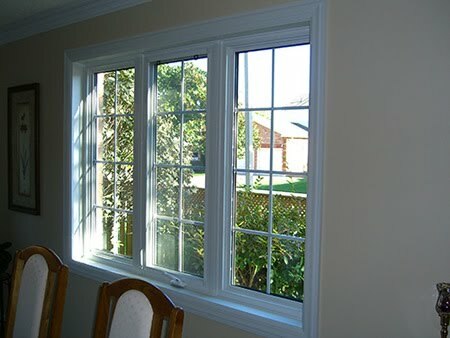 For that reason, it is important for you to understand the different types of windows available. While there are many different types of windows, and their structure affects how they function, there are basic components common to each one. Besides the type of window, to make a wise decision in selecting windows, one must understand the basic components of a window. These are the frame, glass, spacer (for multiple pane windows), coatings, and gas fill. The frame is the material around the glass, and essentially makes the window. The frames can be made from various materials, and the frame material affects the amount of heat the unit can conduct around the glass. There are several different types of frames and they range greatly in price. Vinyl has been a mainstay for cost conscious builders and for this reason come in a wide range of quality. Vinyl is similar in U-Factor as wood and does not have the problem with rotting. However, vinyl does expand and contract greatly, affecting the leakiness of the window; in lower-quality windows, vinyl can degrade with exposure to UV light. These frames are stable and energy efficient. The frames can even be filled with foam to increase the efficiency. The U-Factor of fiberglass frames range between 0.2 and 0.3. Avoid them! While aluminum windows are available, they should be avoided for new construction. Glazing is simply the glass in the window. Glazing can be found in single, double, or even triple pane. Each additional layer of glass increases the efficiency of the window. To truly take advantage of the window panes, the spacing between panes needs to be at least ½ “. The most common coating is Low-E. This works by reducing the amount of infrared energy that enters the home. The coating reflects the energy away from the home. Additional improvements can be made to the coatings by using Heat Mirror technology. This is film adds additional surfaces for Low-E coatings and creates the effect of triple glazing. Gas fill helps reduce the convection heat transfer in the glass. The temperature difference on the glass can create convective flow within the panes of glass. This movement of air and transfer of heat can minimize the benefits of multiple pane glass. By adding heavy gas into the spaces the potential for convective loops are reduced. Spacers are what separate the panes of glass and are often overlooked. There is little that needs to be known about spacers other than when possible select a spacer that has a lower conductivity. The better the combination of these components the more efficient windows will be. There are even windows being developed that will have R-values close to those of the walls they are placed in. There is more to installing windows than just setting the unit into the opening. One must properly seal, flash, and set the window. When installing a window, ensure that you have the window properly set into the opening, the window and opening is flashed to prevent water intrusion, the building wrap is properly installed around the window, and the gap between the window and the rough opening is properly insulated. Having an efficient window does you no good if it is poorly installed!